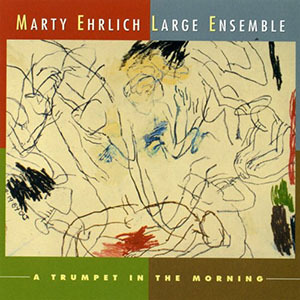 Marty Ehrlich’s monumental opus, A Trumpet in the Morning brings several actions together; much of this concerns the music and dance of Ghana, the trials and tribulations of his home country, but in the main, Mr. Ehrlich has written what is more than simply a waking song; it is a modern kind of griot song that tells the phoenix-like allegorical tale of a poet who will wake up in a fanfare of being born again as a celebratory horn—a trumpet, to be precise. That is one level on which the music works. The other is much more complex, for the chart, “A Trumpet in Morning” is a kind of creation song. Using the brazen characteristics of the gleaming horn, the poet imagines himself being re-born as a trumpet, buffed so he gleams and reflects the sun and the morning in all its glory. Moreover, the writer/instrument are seen to enjoy a symbiotic relationship “from a simple reed…” passing through “spittle of a mule’s jaw” the protagonist comes alive, realizes his potential and eventually triumphs over human adversity as he comes “of living waters done founded a home in that water shed” becoming a flaming desert flower before becoming a trumpet in the morning. The celebratory nature of the piece is magnificent. Mr. Ehrlich uses instrumentation to convey how the transformation takes place from a depressed and subjugated protagonist to one who triumphs. His use of rumbling bass to depict adversity to a series of brass and woodwinds that come together in counterpoint with gorgeous colours and timbres enrobing the human voice that runs down the (re)creation story of the down-and-out poet who wakes up having had an epiphany to be transformed in to a gleaming, triumphant instrument that is magnificently heraldic. And not only do trumpets and winds convey this. Warren Smith’s resonant vibraphone brightens up the gravitas of the musical transformation, even as the music moves through dissonant sequences. Yet even these melt into a wonderful cathartic finale with the brass singing luminously. In all of this J.D. Parran, the bass saxophonist shines bright as the narrator/protagonist of this epic piece of work. There is more to recommend the recording. The “Agbekor Translations” that open and close the recording. The music for both these charts was written by Mr. Ehrlich in collaboration with the Hampshire College Jazz Improvisers Orchestra and the Holyoke College West African Drumming Ensemble. Although none of those players are featured in this sequence of six Agbekor dances from West Africa—Ghana, to be precise—the dances are interlocked with six rhythmic sequences led by the burgeoning rhythm section of Mr. Ehrlich’s large ensemble. This music actually sets up the main fanfare of the lead piece, “A Trumpet in the Morning”. It should not go unnoticed that these song/dances are, however, mighty charts created with a life and beauty of their own as they are stupendous percussion-driven pieces of music. Moreover the swing of delight may be measured in the wonderful manner in which the rhythm section—especially the drummers—take over. “Blues for Peace” is a longish prelude to “Rundowns and Turnbacks”. Both are composed as narratives that tell the tale of American life, not as Norman Rockwell would have it, but rather as the bluesman might experience it. This means that Mr. Ehrlich does not shy away from the raw and visceral energy that characterises the plight of blues people. In the latter piece, the music opens up even more, taking off from the characteristic style of playing developed by Robert Johnson. Howard Johnson and Joseph Daley excel in their roles. Both experienced musicians seem to have absorbed the music in a mighty manner. Mr. Ehrlich also quotes from various important environmental events in the recent history of the United States, such as Katrina. But here too and in keeping with the socio-political statement of the music discrimination and other blights on the landscape of the maps of the United States are examined, with exquisite musical sense. This in turn presents Marty Ehrlich in a brand new light and puts his epic recording in line for some major recognition. Track List: Prelude: Agbekor Translations; A Trumpet In The Morning; Blues For Peace; Rundowns And Turnbacks; M Variations (Melody For Madeleine); Postlude: Agbekor Translations. Personnel: Marty Ehrlich: clarinet, bass clarinet (4), conductor; J.D. Parran: narrator, soprano and bass saxophone (1, 2, 6); Andy Laster: alto saxophone ( 1- 6); Robert DeBellis: alto and soprano saxophones, clarinet (1 – 6); Jason Robinson: tenor saxophone (1 – 6); Adam Kolker: tenor saxophone, clarinet ( 3 – 5); Howard Johnson: baritone saxophone (1, 2, 6); Lisa Perrott: baritone saxophone, bass clarinet (3 – 5); E. J. Allen: trumpet (1 – 6); Ron Horton: trumpet (1 – 6); James Zollar: trumpet (1 – 6); Miki Hirose: trumpet (5); John Clark: French Horn (3 – 5); Ray Anderson: trombone (1 – 6); Michael Dessen: trombone (1 – 6); Curtis Fowlkes: trombone (3 – 5); Joseph Daley: tuba (1, 2, 6); James Wideman: piano (1, 2, 4, 6); Uri Caine: piano (3 – 5); Warren Smith: vibraphone, percussion (1, 2, 5); Jerome Harris: slide guitar (4, 5); Brad Jones: bass (1, 2, 4, 6); Drew Gress: bass (3 – 5); Eric McPherson: drums (1, 2, 4, 6); Matt Wilson: drums (3 – 5). Marty Ehrlich is celebrating 30 years in the nexus of creative music centered in New York City. He began his musical career in St. Louis, Mo. while in high school, performing and recording with the Human Arts Ensemble. He graduated from the New England Conservatory of Music with honors in 1977, where his teachers included George Russell, Jaki Byard, Joseph Allard, and Gunther Schuller. Since that time, he has made 25 recordings of his compositions for ensembles ranging in size from duo to jazz orchestra. These groups include his Emergency Peace Ensemble, Traveler’s Tales Group, Rites Quartet, and the Marty Ehrlich Sextet. He has recorded a CD length work for 26 musicians entitled “The Long View”, and has two acclaimed recordings in Tzadik’s Radical Jewish Culture series. As a multi-instrumentalist, passionate about improvisation and interpretation, he has performed with a who’s who of contemporary composers including Muhal Richard Abrams, Ray Anderson, Anthony Braxton, John Carter, Jack DeJohnette, Anthony Davis, Mark Dresser, Michael Formanek, Don Grolnick, Chico Hamilton, Julius Hemphill, Andrew Hill, Wayne Horvitz, Robin Holcomb, Leroy Jenkins, Myra Melford, James Newton, Bobby Previte, Leo Smith, and John Zorn. He appears on over 100 recordings with these and other composers. Ehrlich has performed with the Chicago Symphony, The BBC Symphony, the New York City Opera, Lincoln Center Chamber Society, and other classical ensembles. He is currently presenting a concert program for 12 musicians entitled “Julius Hemphill: A Composer Portrait”. 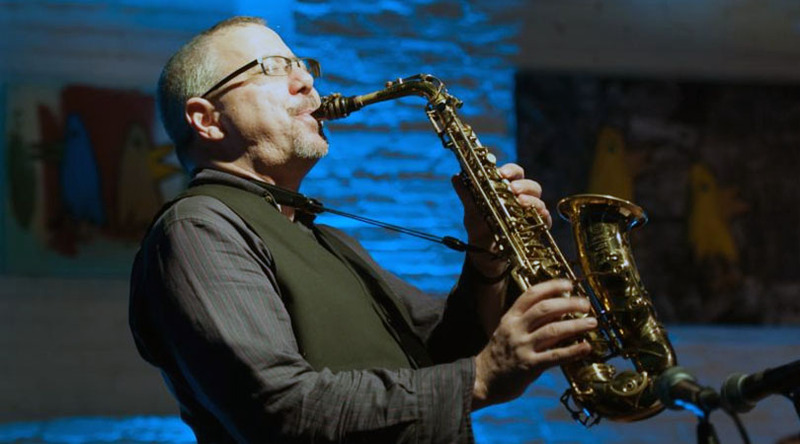 His honors include a Guggenheim Fellowship in Composition, the Peter Ivers Visiting Artist Residency at Harvard University, composition grants from Chamber Music America and NYFA, Clarinetist of the Year from the Jazz Journalist Association, and a Distinguished Alumni award from NEC. He is currently Associate Professor of Jazz and Contemporary Music at Hampshire College.